To make its 15-year deal - which is worth more than $120 million - Abercrombie & Fitch is not only taking the entire approximately 13,500 square-foot two-level store, but is also leasing two floors of the 15-story office building for its own offices. 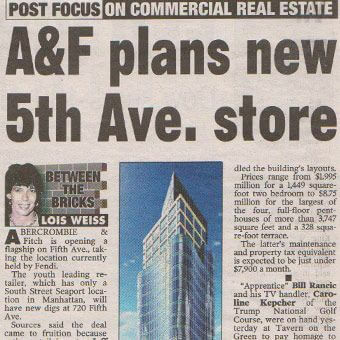 A&F was represented by Laura Pomerantz of PBS Realty who could not be reached for comment. Sutton has taken over a good swath of that section of Fifth Ave. by storm. A few years ago, he and partners bought 609 Fifth Ave. and then brought in Chicago-based American Girl to hang its red awnings on most of that building. A few weeks ago, as The Post first reported, Sutton and Sam Zell's Equity Office agreed to buy 717 Fifth Ave. for more than $350 million. Sutton had been working with Zell when retail broker, Robert K. Futterman introduced Lloyd Goldman to Zell. Sutton and Goldman own other retail pieces together and partnered up with Stanley Chera to buy the Hugo Boss and Escada-leased 40,000 square-foot retail piece while Equity Office will take over the tower. That deal is being brokered by Wayne Maggin of Eastdil. Related Companies is kicking off the marketing of its Astor Place condo by taking the sales in-house. After bringing in Susan de Fresca from Davis & Partners in 2001, Related had her coordinate inhouse efforts for its luxurycondo sales at the Time Warner Center which ere overseen by a previous boss, Louise Sunshine's Sunshine Group. Related has now appointed de Fresca as president of its new Related Residential Sales division. Lucky for all, that deal was never consummated with Cooper Union, the owners of the lot which is bounded by E. Eighth St. a/k/a Astor Place, The Bowery and Lafayette St. Instead, Cooper Union eventually agreed to a prepaid 99-year lease with Related which is creating co-op apartments with condominium rules. Charles Gwathmey and his firm, Gwathmey Siegel and Associates have designed this as the firm's first multi-family residential building. Gwathmey also chose the fixtures while architect Ishmael Levya handled the layouts. Prices range from $1.995 million for a 1,449 square-foot two bedroom to $8.75 million for the largest of the four, full floor penthouses of more than 3,747 square feet and a 328 square-foot terrace. The latter's maintenance and property tax equivalent is expected to be just under $7,900 a month. "Apprentice" Bill Rancic and his TV handler, Caroline Kepcher of the Trump National Golf Course, were on hand yesterday at Tavern on the Green to pay homage to Greg Cuneo, chairman of HRH Construction, who is teaching Rancic the construction business. Cuneo was being honored by the Metropopolitan Jewish Council on Poverty, for which he constructs mini-projects when not building towers for Donald J. Trump. Rancic told us he can't walk into a building anymore and look at it the same way. Now he sees all the problems. Trump and Cuneo along with co-developer Lou Capelli break ground on Trump Tower of White Plains on Monday. Investment banker Peter Spies has left Lazard Freres and will become a managing director at Goldman Sachs where he had toiled during the 1980s.